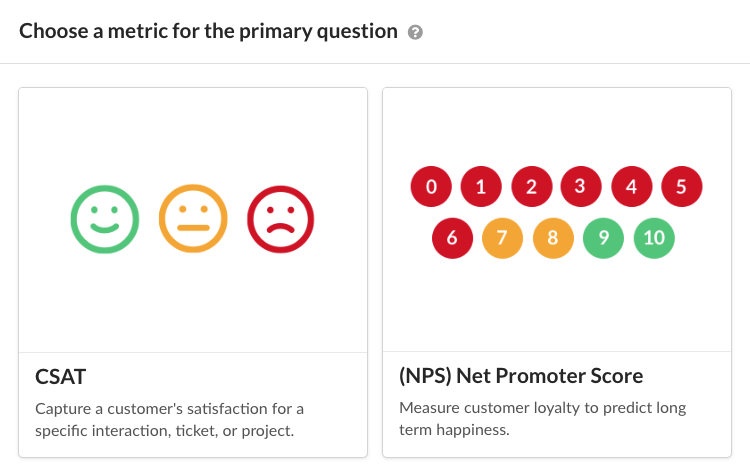 Get better feedback by creating fun and intuitive surveys your customers will actually love. All feedback is collected in a structured way and presented in straightforward dashboards, which gives you the insights you need to improve customer satisfaction. Embed a CSAT survey into your existing helpdesk email workflow. Send your customers recurring email NPS surveys. Add surveys to your employee's email signatures. Include surveys in follow up emails after a project is completed. The first step when creating a new survey is to choose the primary question. This is the most important question of your survey. Think of it like this: if you could only ask your customers ONE question after a specific interaction, or at some point in time, what would it be? You can use the defaults provided, or customize elements such as the icons, rating scale, or choice labels. The follow-up question uses a bit of conditional logic based on the answer from the previous primary question. Additional questions are used to gain even more insight and information about how your customer feels. Multiple choice - Choose between two and five options. Sliding scale - A slider presented on a 0-10 scale. 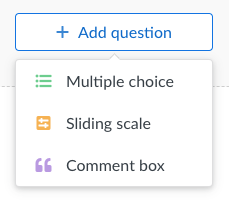 Comment box - Free flow text answer. Click the preview button to see how the survey will actually appear for your customers. Clicking the preview button emulates what your customer would see after they clicked a positive link from an email. Preview clicks will be recorded as real ratings from the customer "Tester McTestface". You can delete these from the Feedback page. You must save a survey before viewing the latest updates on the preview page. The last past of your survey will show a "thank you" page. You can customize this content based on the sentiment form your primary question. Like in the Build section, feel free to use the defaults provided, or customize to your heart's desire. Choose between two main ways to source feedback: embed or email. The embed option is great for including a survey in any existing emails or ticket workflows you have. 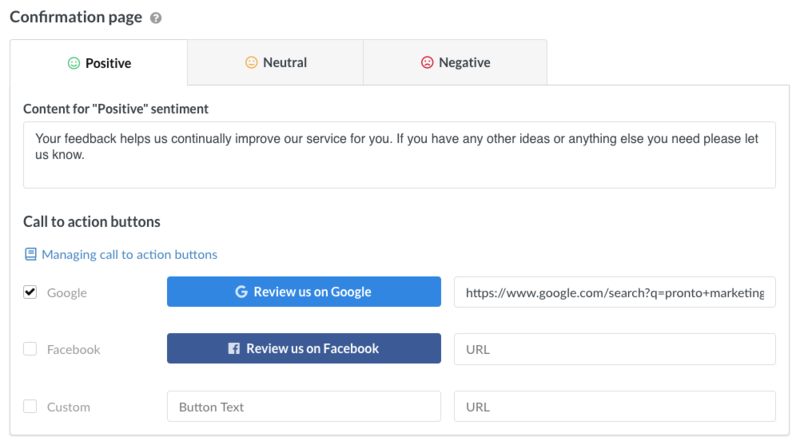 Helpdesk - Add rating buttons into your "solved" or "closed" support ticket email templates for ConnectWise, Zendesk, Autotask or other popular helpdesks. Email - Include rating buttons in your (and your employee) Gmail or Outlook signatures to allow ay of your email recipients to rate your service. Simplesat integrates with a number of helpdesks, enabling you to sync ratings back to the original ticket, and pull in ticket information to Simplesat. Email surveys use the Simplesat platform to deliver emails to your customer. With an email survey you can customize the sender email address, subject line and email content. Note: email surveys first require you to import your contacts into Simplesat. View our current integrations to see which platforms we can sync with. Reach out to Simplesat support if you have any questions, or need a quick demo. Don't think of this as implementing a big new system. You can always roll things back: remove the embed code, or pause the survey. If you have any question about which type of survey's right for you just let us know and we'll be happy to help!